onwards. The last date to submit the application form along with the relevant documents and the signed photograph is on or before 09-11-2018. The candidates will be selected based on the merit in the online written examination. For more details of age limit, salary, educational qualification, exam pattern, and syllabus, application fee and how to apply are given below for the posts of Supervisor, Junior Technician, and Junior Office Assistant in Bank Note Press Recruitment Notification 2018. For more information candidates can check in the official notification given below. 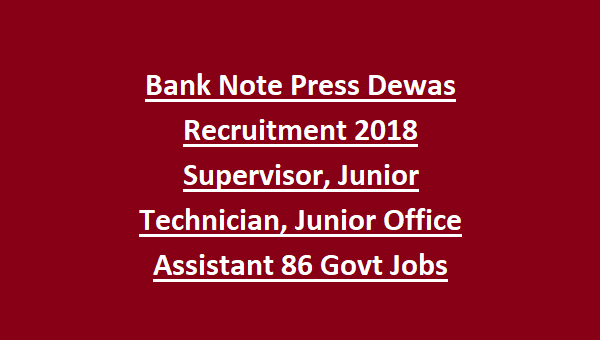 The age limit for the Govt jobs in Bank Note Press Recruitment 2018 is in between 18 – 30 years as on 09-11-2018. The educational qualification for the Bank Note Press Govt Jobs based on the Post Name wise is given below. For Safety Officer/Welfare Officer – Candidates should have done Degree/Diploma. For Supervisor (Printing and Platemaking, Electrical, Information Technology, Air Conditioning, Technical Support-Civil, Ink Factory) – 1st class Diploma/ B.E/ B.Tech in printing Technology/ Electrical/ Electronics/ IT/ Computer Engineering/ Civil Engineering/ Dye Stuff Technology from AICTE Approved Institute. For Junior Technician (Ink Factory, Printing & Platemaking) – Full-time ITI Certificate in Printing & Plate Making/ Paint Technology. For Junior Office Assistant – Degree with 55%, Computer Knowledge and Typing Speed in English is 40 wpm/ Hindi 30 wpm. The salary offered for the candidates is Rs.7750 – 110000/-. The application fee for the candidates belongs to Gen/OBC category is Rs.400/-. There is no fee for ST/SC/Ex-s/PWD category candidates. Payment of fee through online mode is from 13-10-2018 to 09-11-2018. The candidates will be selected based on the online written examination. The online written exam will be comprising of objective type questions. The online written exam and typing test will be conducted at selected centers are November/December 2018. For the posts of Junior Office Assistant is typing test on computer and online test. Candidates selected in the typing test will be called for the online test. The exam pattern for Junior Technician, Junior Office Assistant is given below. 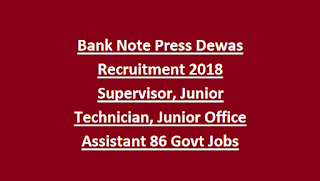 Interested and eligible candidates can apply for these jobs through the online official website of Bank Note Press is www.bnpdewas.spmcil.com from 13-10-2018 onwards. The last date to submit the application form along with the relevant documents and the signed photograph is on or before 09-11-2018.